This week, we confess we made kind of an etiquette error ourselves. See, we invited Caroll Spinney to our studios. His name you might not know, but his work you surely do. For 45 years he’s been the voice behind — and the man inside — Sesame Street’s Big Bird. He also performs Oscar the Grouch. There’s a new documentary about Carrol out this week, called “I Am Big Bird.” But, after chatting with him about it for a bit, we impolitely asked if he could let us speak with someone else. Brendan Francis Newnam: Well, Caroll, it’s been great talking to you, but we asked our audience to send in etiquette questions for Oscar, and he seems like just the guy for the job. Caroll Spinney: Are you ready for that, Oscar? Oscar the Grouch: Hand it to me. Archival photo of Caroll Spinney and Oscar The Grouch. Photo courtesy of Gary Boynton/Puppeteers of America. Brendan Francis Newnam: Are you ready for them? Oscar the Grouch: Oh, yeah. Heh. Brendan Francis Newnam: There he is. Brendan Francis Newnam: Wow, and it smells like trash in here all of a sudden. Oscar the Grouch: Well, Jenny, it sounds like you have a perfect roommate to me. Besides, what’s wrong with ants? Boy, are you picky! Picky, picky, picky! Brendan Francis Newnam: Can Jenny’s roommate move in with you, Oscar, in your trash can? Oscar the Grouch: Yeah, there’s a lot of room. Oscar the Grouch: Yeah, well, let’s see. I can relate to myself. Grungetta and I haven’t seen each other in years, you know? And, for us, heh, heh, absence makes the heart grow fonder. Brendan Francis Newnam: Like, complete absence. Oscar the Grouch: Out of sight, out of mind. Try ’em both, see which one works best. Brendan Francis Newnam: Oscar, you have such glee when you deliver this advice. Oscar the Grouch: No, I don’t. Rico Gagliano: Well, there you go, Tom. So, just ignore your significant other. Oscar the Grouch: Shoot the next one. Archival photo of Caroll Spinney puppeteering Big Bird. Photo courtesy of Robert Furhing. Rico Gagliano: Here’s something from Liz in New Haven, Connecticut. Liz writes — and this goes back to something you mentioned earlier, Oscar: “What is the most people you should invite over to a party at a small studio apartment?” This is perfect for you, since your trash can is barely big enough for yourself. Oscar the Grouch: Yeah, well, heh. Let me see, how would I tell you this? I hate parties, so I wouldn’t invite anyone over. But, if I had to, I’d invite way more people than I could fit into the apartment, because that would make everybody really grouchy. [Laughs] I like that. Rico Gagliano: Very uncomfortable. And, don’t serve them any food or drinks. Brendan Francis Newnam: That’s how we live in New York though. Oscar the Grouch: Well, this is New York. Rico Gagliano: Yeah. It’s full of people like you, Oscar. Brendan Francis Newnam: All right, that’s your answer, Liz. Invite tons of people so they can all be grouchy. Oscar the Grouch: Wow, yeah, what a question. I’ll be serious on this one, okay? Since my social plans would all involve being with grouches, I’d go and let the grouches run free! Rico Gagliano: I think you answered your own question there, Rebecca. Brendan Francis Newnam: But, Rebecca is the one guest who has gotten an actual answer from the Grouch. So, well done, Rebecca. 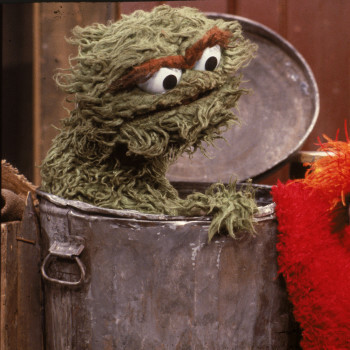 Oscar the Grouch: Rebecca, don’t ever thank me. Rico Gagliano: Yes. Don’t send a card, please. Here’s a question from everyone in America — this is our standard question we ask everyone who does our etiquette segment: What is the most memorable get-together you’ve ever been to, Oscar? Oscar the Grouch: Uh, let me think of a good answer here. This is America I’m talking to. The most memorable get-together, for me, was my Grouch family reunion at Swamp Mushy-Muddy. [Sings] Swamp Mushy-Muddy, Swamp Mushy-Muddy, it’s icky and yucky and cruddy. It rained the whole time, so we were all soaked. We sloshed around in the mud, and it was the best time ever. So, try to duplicate that for yourself, and you’ll be as miserable as me. Archival photo of Caroll Spinney and Snuffleupagus (back when he was just imaginary) on the set of Sesame Street. Photo courtesy of Debra Spinney. Rico Gagliano: There you go. Head to the swamp. Brendan Francis Newnam: See, it doesn’t surprise me that Oscar the Grouch would like a family reunion, an occasion that is often uncomfortable and people act grouchy. That seems perfect. Rico Gagliano: You also like traffic jams. Oscar the Grouch: Oh yeah. Anything to feed the grouch. Oscar the Grouch: Never thank a Grouch! Brendan Francis Newnam: All right, sorry. No thank you. Thanks for nothing. Oscar the Grouch: I never liked you. Brendan Francis Newnam: I never liked you, either. If you see Caroll, tell him we didn’t like him either. Oscar the Grouch: Don’t say that. He might cry. Rico Gagliano: Get off our show, Oscar. Oscar the Grouch: Oh hey, hey! I’m beginning to like this guy.